Free Printable July 2016 Calendar. 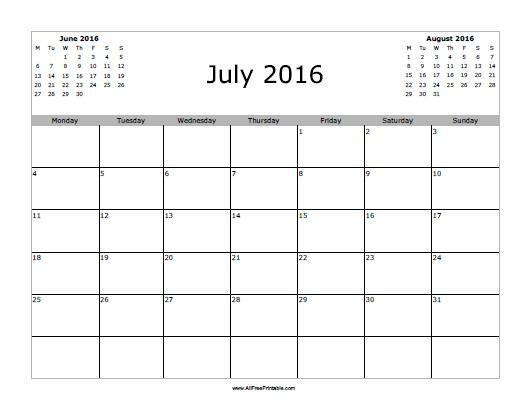 Find July 2016 Calendar to Print Free here. Great printable calendar to help getting organized at work, classroom, home, small business or where you need it most. The free calendar includes the previous and next month. 2 printable options available, calendar that start the week on Monday or Sunday. Use our free printable July 2016 calendar to write important things to do this month, like summer vacations, summer camp, cruise vacations, hotel reservations, family trip, travel planning, shopping, summer school, things to do at home and more. Click the link of your choice to download or print now.